Mt. 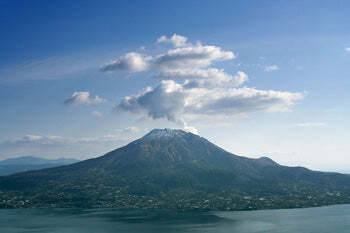 Sakurajima, an active volcano located in the Kagoshima Bay, that is recognized as the symbol of Kagoshima. Kagoshima is the southern gateway of Japan. Southerly ocean breezes provide Kagoshima Prefecture with a temperate to sub-tropical climate thus making the weather typically mild and comfortable year around. The region has a long history of volcanic activity with eleven still active, such that much of the land throughout Kagoshima has been covered in a layer of volcanic ash known as “shirasu” (in Japanese). This ash helps produce soil that is exceptionally rich in minerals. Abundant rainfall plus a very suitable growing climate and soil make Kagoshima Prefecture a premiere supply base of agricultural products for the rest of Japan. One of these products is excellent green tea. There are several theories how green tea cultivation took root in Kagoshima. The most agreed upon is that a Buddhist priest from the Kyoto area traveled to the hamlet of Yoshimatsu approximately 700 years ago to establish a temple, and thereupon cultivated the first camellia sinensis plant. Tea production occurred only in local areas and remained quite small for several hundred years. Later during the Edo Era (1603-1867) the predominant Satsuma clan encouraged tea cultivation on farms for wider commercial purposes. This increased production greatly but the tea quality was poor and most of it was consumed regionally. In 1887 the first tea producers association was instituted in an effort to improve quality, but it was not until the early 1950's that real improvement was achieved. This was when a large contingent of apprentice farmers relocated to the famed Makinohara region of Shizuoka to learn advanced tea growing and processing techniques. After completion of their training the apprentices returned to Kagoshima and theYabukita cultivar (first developed in Shizuoka) was introduced, thus better quality tea production took hold. 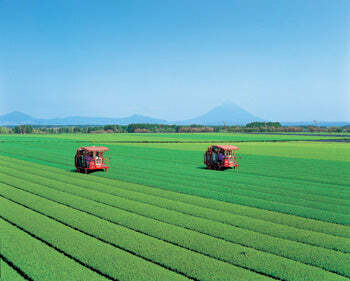 By 1975 Kagoshima Prefecture was producing significant amounts of green tea. Even so, the quality and taste of Kagoshima green tea remained relatively inferior to that from other parts of Japan because production facilities were still developing their skills. During these years, much of the raw tea production of Kagoshima was shipped to Shizuoka to be further processed and blended with the much better quality teas from that area. Then in the late 1980's the Kagoshima Prefectural Government mounted a concerted effort to improve quality and name recognition by strengthening the Tea Experiment Station and Tea Growers Association. Their efforts have resulted in considerable success. Due to the broad, flat terrain of Kagoshima Prefecture, long perfectly-aligned rows of tea can be planted and then harvested by mechanical harvesting machines developed exclusively for this purpose. These unique high-volume harvesters are highly efficient and effect a very precise and even pluck of each tea leaf. Presently the Yabukita cultivar represents 41% of total tea production in Kagoshima compared to a national proportion of 76%. Yabukita production is smaller in Kagoshima Prefecture due to the fact that an astounding variety of new camellia sinenses cultivars have been developed there in the last three decades. Twenty eight percent of Kagoshima green tea comes from the Yutaka Midori cultivar followed by smaller amounts from the Sae Midori and Asatsuyu. Others include the Okumusashi, Kanaya Midori, Zairai, Asanoka, and Sakura Jima. Tea leaves from two or more of these cultivars are often blended to achieve the desired aroma and taste balance. The combination of exemplary growing conditions, high-volume harvesting and skilled processing give Kagoshima tea producers comparative advantages over all others in Japan. High quality at reasonable prices have garnered Kagoshima green tea a growing international reputation. It can be concluded that the Kagoshima tea industry is in a constant state of effectively pursuing improvement of total quality management, and that Japanese green tea consumers throughout the world are reaping the benefits. In modern facilities staffed with proficiently skilled tea artisans, Kagoshima Prefecture produces approximately 26% of the total national output of finished tea, while Shizuoka Prefecture produces 45%, a combination that dominates the production of Japanese green tea. Other areas with limited tea growing and processing potential such as Uji, Yame and Saga each produce only small amounts of the total which makes their green tea relatively expensive due to a restricted supply. 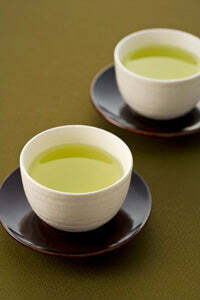 Today the majority of Japanese green tea farmers are older than age 60. And while the number of Japanese people interested in becoming tea farmers decreases, large numbers of human labor intensive tea farms are being abandoned. Most areas of Japan harvest their tea crop two or three times per year while Kagoshima tea growers harvest four times, and in some years five times if weather conditions are favorable. With these factors in mind, along with the previously mentioned advantages, Kagoshima Prefecture is likely to remain the second or perhaps become the leading production area in Japan. The future is bright for Kagoshima green tea. Kagoshima Prefecture is a delightful travel destination. It is easily accessible from all parts of Japan via the Shinkansen (bullet train) or by its international airport located in Kagoshima City. We suggest traveling in the area by car because it makes it possible to tour the beautiful countryside at a leisurely pace and view first hand and close up the ubiquitous and quite impressive green tea fields located throughout the region. Please view the travel suggestions on our Useful Links page.